Have You Wanted Your Own Koi Pond, But Just Don’t Know Where to Start? We’ll show you how to get started, and be on your way to relaxing next to your very own koi pond on a beautiful Summer afternoon . . .
Do you want to add some spice to your yard? Are you interested in an outdoor Koi fishpond but have no idea on how to get started? If this sounds like you, you are not alone. But luckily, we have put together a great guide which will supply you with all of the information that you need in order to get off on the right foot. Enjoy the Beauty of Your Own Koi Pond! Here’s just a few things you’ll discover with this time-saving guide . . .
A major step in ensuring that your Koi pond is successful is knowing what you are doing during the building stage of the process. We are aware of this fact, and that is why we offer our readers (and listeners) 16 pages of information on how to effectively build a Koi fish pond. Your Outdoor Koi Pond will give you information on everything from cost to supplies. It is the number one source available when it comes to a step by step program on building a top notch pond. You don’t have a Koi pond unless you have the fish to go into it. Many people overlook this because they are so caught up in making their pond look good. This is all well and good, but the fish are what makes the pond a pond! Your Outdoor Koi Pond will give you pages of information on the different species of Koi, as well as which ones will best suit your needs. To avoid a bad purchase simply read over the appropriate chapters; this will be sure to put your mind at ease. Your Outdoor Koi Pond will give you tips, as well as maintenance information in order to ensure that your Koi are always going to live in a happy and healthy environment. Your Outdoor Koi Pond makes understanding maintenance easy. In fact, we are so concerned about you keeping your pond and fish in tip top condition that we devoted two chapters to the subject; one on caring for your Koi, and the other one on caring for the actual water. After reading this book you will never again have a question on maintenance. Don’t let the fact that you live in a cold climate kill your dreams of owning a Koi pond. We know that everybody loves these ponds so we made it a point to include a lot of information on cold weather care. Your Outdoor Koi Pond details what it takes to run a successful pond in a cold climate. Don’t rely on the words of another source; Your Outdoor Koi Pond offers the most detailed information on cold weather care. 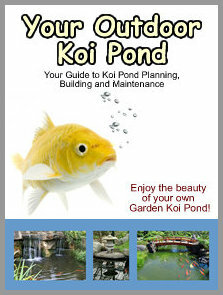 Sure, we are going to give you tons of information on how to set up your Koi fishpond. After you are all done with this book you will be able to sit back, relax, and listen to your Koi splash around in the water. But before you get started, we are going to offer another sound that is going to bring pleasure to your ears. When you order Your Outdoor Koi Pond, you are going to get more than just an e-book. We are also going to allow you to download a high quality audio recording that will make learning about this hobby a piece of cake. Order a copy of Your Outdoor Koi Pond to read or listen to some of the most comprehensive information that is available on this hobby. Join hundreds of other people who have used this book to turn their yard into paradise! File Size : 44mb approx.